Pip Wilson bhp: An obnoxious person is a hurting person..Can you help me to understand something? 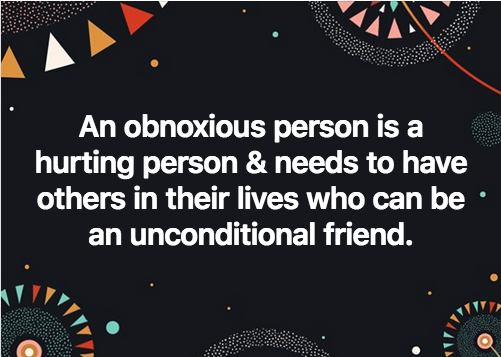 An obnoxious person is a hurting person..Can you help me to understand something? to this Young Offenders Unit. That move changed the rest of our lives. Since then I have been trying to work something out. MANY things need working out but this one thing is stirring my soul of late. damaged kids who have lived a far more extreme life than mine. Hurt Neglected Abused Beaten Corrupted ............ lives of hell. I have seen and heard & felt, ALSO, their parents pain. Even though in many cases I have never met them. I can sense their damage - feel it - have empathy with them in it - in their mess. But the young person, in most cases, cannot. Do you feel the hurt so much by another human that you can't see through their behaviour to empathise with their damage? Are you so hurt by their treatment of you? That you can't accept their damage? If so - what can be done by the damaged child/youth/adult, or me in a helping relationship, to help the person through this? I suppose it is about forgiveness. About accepting the past behaviours & moving on with an inner conversion of acceptance EVEN if the abuse continues? I would like to be able to help. I ask questions - help people to suggest options for themselves. Any thoughts of pointers to see into this challenge would be very much appreciated.